Triumph of the Will at Willard! Faculty, Please remember that you are expected to march in the upcoming commencement ceremonies and that you must purchase your Willard College-approved apparel from the bookstore by the end of the month. It is critically important that we present a unified Willard brand to our graduating seniors and their fee-paying parents. Marching in step is all the more important this year because of our innovative commencement program. As you know, the search for a commencement speaker who can direct the audience toward the Willard experience, hit the ten “Willard Way” themes, and reinforce our price point, is never easy. After an exhaustive search by one of the nation’s top speaker engagement firms, Spotlight Speakers and Entertainment, we have secured the services of the one the world’s greatest film-makers, Herbert Kutschbach. 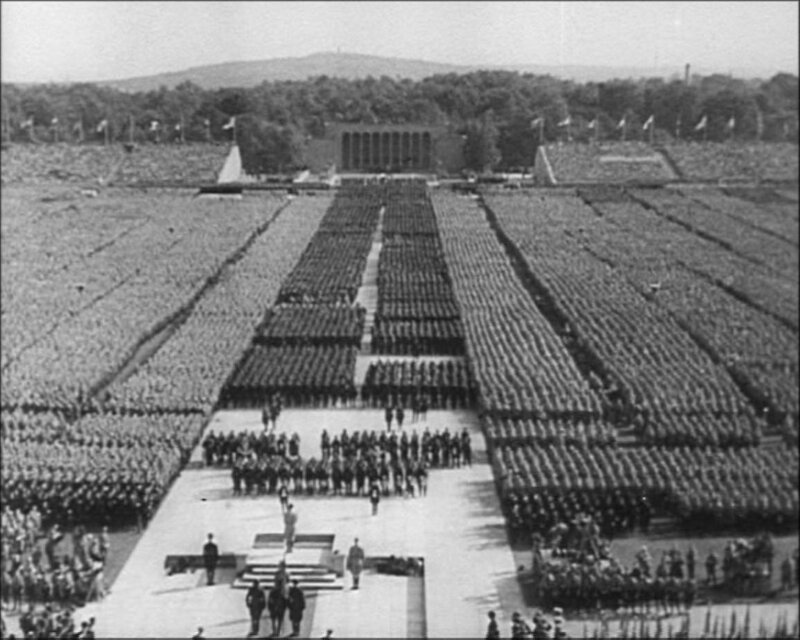 The last surviving member of Leni Riefenstahl’s film crew, Mr. Kutschbach will reflect on his early path-breaking work. To close the loop between his address and the graduation ceremonies, the theme of this year’s commencement will be “Triumph of the Will at Willard College: Achieving Excellence after Graduation.” At the speaker’s recommendation, the commencement will be held at night, with each procession participant carrying a torch! Obviously, we do not want to see any of the sorts of displays by malcontents that marred last year’s events. And to make sure the procession goes off without a hitch, there will be weekly practices, starting next week. Please keep an eye out for announcements of the schedule as it may require rescheduling class-time with seniors. I could really see this slogan taking off. “Triumph of the Willard” evokes a successful, forward-looking, take-all-comers approach that will stir up a great fuhrer — er, fervor — of loyalty among fee-paying parents and consumer/students for the Willard brand.